Hello Yelp elite gold badge 2015! Oh happy day! Triple gold! 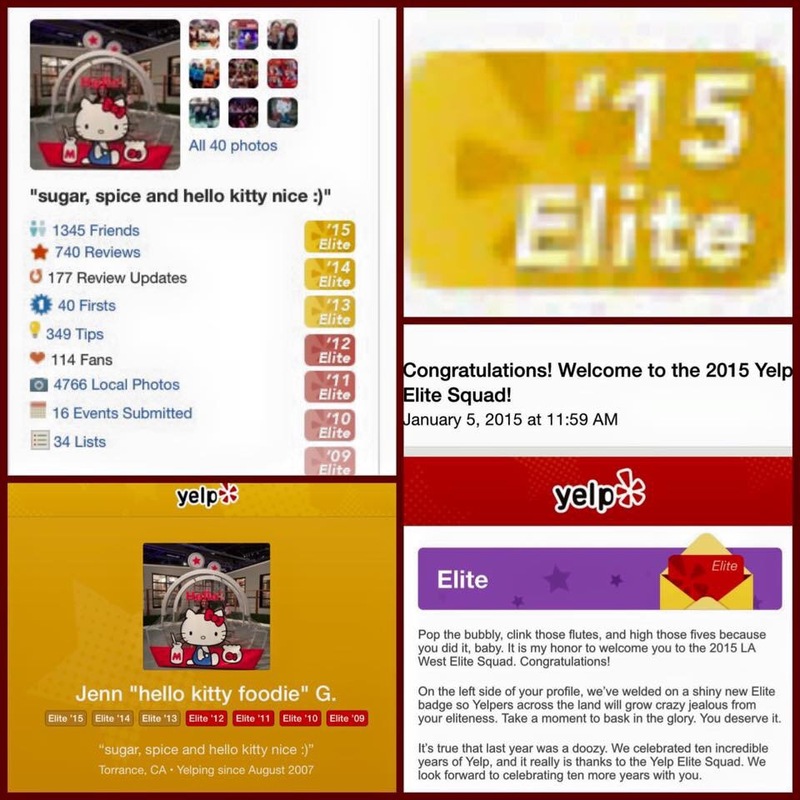 I was so happy today when I opened up my Yelp page and saw a sparkly, shiny new Yelp elite gold badge for 2015! I can’t believe it’s my seventh yelp elite badge! It seems like only yesterday that my Yelp journey started. It’s been quite a Yelp journey so far. There’s been interesting moments (I once got a marriage proposal via Yelp. No wedding for me though lol. I don’t think the guy liked Hello Kitty. 😉 Haha! The only shiny thing I’m sporting these days courtesy of Yelp is my elite badge). 😉 There’s been heartwarming moments (I once got the sweetest card from the folks at Susie Cakes). There’s also been some frustrations (I was a little sad after I wrote a four star review for a bakery and someone from there sent me nasty note complaining about a picture I took of their croissant. After I wrote the nicest review, all the could comment on was about a picture they didn’t like). Most of all, there’s definitely been lots of unforgettable, fun moments! (I love all the friends I’ve made through Yelp! I’ve also loved all the events I’ve been to! Thanks to my Yelp friends, this once shy little Yelper is slowly coming out of her shy little shell). All of these various Yelp experiences have made me into the Yelp Elite that I am today and I continue to write Yelp reviews with the hope that they can be helpful to others and just maybe make some smile. I am so thankful for the another year to be Yelp elite. I can’t wait to see what this Yelp year will bring! SYOY (see you on yelp) and smile! Hello Yoshinoya Japanese Kitchen: New Taste and New Look!